Colorful corals make life possible for a diverse array of sea creatures on reefs throughout the tropics. Orange anemones, purple sponges, and bright blue giant clams attach themselves to corals while fish of every size and hue rely on the reef for shelter. Sharks, sea turtles, whales, groupers, and other species rely on this coral-based ecosystem for food. Unfortunately, coral reefs around the world are beginning to lose their vibrancy as rapidly warming ocean temperatures continue to turn their colorful branches, mounds, and fans a ghostly white. A coral reef in American Samoa, photographed before, during, and after a bleaching event. Coral bleaching, has severely impacted coral reefs from the Pacific to the Caribbean since 2014. (Image Credit: Catlin Seaview Survey). A coral’s color comes from the presence of beneficial algae, known as zooxanthellae, which live inside coral polyps. Corals and zooxanthellae have a symbiotic relationship; corals provide shelter and zooxanthellae provide a source of food. But when seawater becomes too warm or polluted, corals become physiologically stressed and expel their algal companions. If environmental conditions take too long to return to normal, the corals will starve or succumb to disease and eventually die. This phenomenon, known as coral bleaching, has severely impacted coral reefs in South Florida, home to the only living barrier reef in the continental United States. Stretching from the Florida Keys to Palm Beach, this delicate reef system supports a diverse array of marine life and acts as a breeding ground for key economic fisheries in the region. Florida’s reefs also help to blunt storm surges, prevent coastal erosion, and support a vibrant ecotourism industry. According to NOAA, coral reefs in Southeast Florida alone generate $4.4 billion in local sales and $2 billion in local income and support 70,400 jobs. Following severe bleaching in 2014 and 2015, Florida’s corals have been slow to recover. In addition to elevated ocean temperatures, factors such as coastal development and runoff, marine pollution, and overfishing disrupt the ecological balance of coral reefs. Marine sanctuaries can help to mitigate these threats and promote coral recovery from bleaching events. Coral bleaching in the Florida Keys. Stretching from the Florida Keys to Palm Beach, this delicate reef system supports a diverse array of marine life and acts as a breeding ground for key economic fisheries in the region. (Image Credit: NOAA). 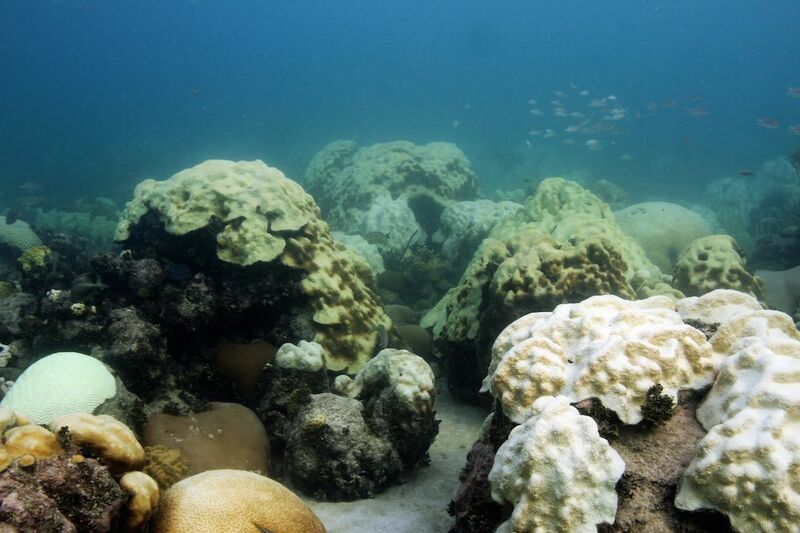 Coral reefs beyond the Keys have also been hit hard by bleaching, from American Samoa and Hawaii in the Pacific to Puerto Rico and the U.S. Virgin Islands in the Caribbean. In 2016, 93 percent of corals in Australia’s Great Barrier Reef, the largest coral reef system in the world, experienced bleaching. The 2014-2017 global bleaching event is the longest lasting and most severe bleaching episode to date. Much of this bleaching can be attributed to a rise in ocean temperatures driven by climate change and an abnormally strong El Niño event in 2015-2016. As the climate warms, scientists fear that the excess heat absorbed by the ocean will increase the frequency of bleaching events.